If you are looking for a simple, healthy recipe…look no further! Don’t get me wrong, I love eclectic tastes and adventurous eating, like Kelly’s Sausage Stuffed Peppers, but sometimes you just need good old fashioned, traditional food that takes you right back to your Grandma’s kitchen. I know, I know…most of you are looking to save time, but please…just for a moment, join me in a little meditation. I want you to think about the amazing smells of peppers, onions, garlic, and red sauce (or gravy, as some families call it) simmering all day long. Now take a few deep breaths…how about one for everything that is on your mind (please, don’t hyperventilate!). Alright, feel better?! 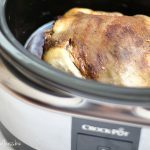 Great, because your about to recreate that smell in your slow cooker, in just a few simple steps! Sometimes, less is truly more. 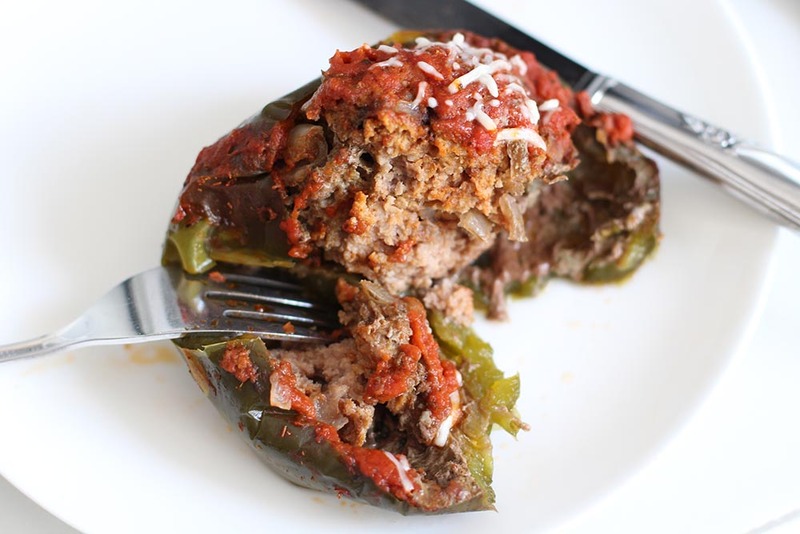 These slow cooker stuffed peppers are so easy to make, only require a couple of ingredients, and can be added right to the slow cooker or assembled and frozen for later. This dish presents beautifully, especially if you use a variety of colored peppers, so feel free to invite friends over for dinner!! Cook fresh or freeze and cook later. Serve with rice and parmesan cheese. Coat bottom of slow cooker with 1 tablespoon of olive oil. In large bowl, mix ground meat, onion, garlic, and 2 tablespoons of pasta sauce. Separate mixture into four equal parts and firmly stuff into peppers. 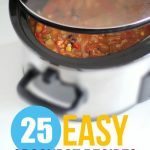 Place peppers in slow cooker and cover with remaining pasta sauce. Cook on low for 6-8 hours or until meat is cooked through and peppers are soft. 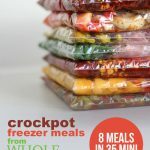 Label a gallon-sized plastic freezer bag with the name of the recipe, use-by date (which will be three months from the prep day), and cooking instructions. In large bowl, mix ground meat, onion, garlic, and 2 tablespoons of pasta sauce. Separate mixture into four equal parts and firmly stuff into peppers. 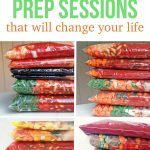 Add remaining sauce to a quart-sized plastic freezer bag, seal, and place inside gallon-sized bag with stuffed peppers. When ready to cook, thaw freezer bag. 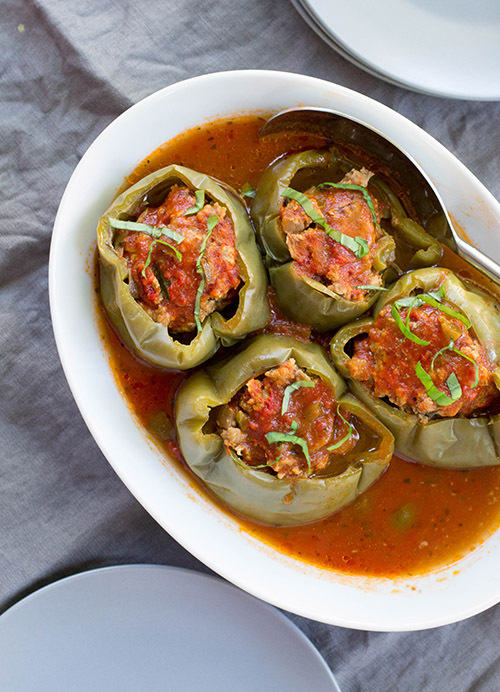 Place peppers in an olive-oil-coated slow cooker and top with sauce. Cook on “low” setting for 6-8 hours. Jill Petrush Rogers is a full-time working Mama to two very active little boys, ages 4 years & 17 months. After becoming a Mama, she realized that her mission is to help others meet and/or exceed their own personal breastfeeding goals. And so, she became a Certified Lactation Counselor. You can follow Jill’s personal journey on her blog The Galactagoddess and on Facebook. Do you think ground pork would work? So do you put the meat in raw? My last attempt at stuff peppers was just awful! The peppers were undercooked and the filling was just so bland (I cooked in oven, not crockpot). I am excited to try these and redeem myself with a couple of our shut-ins who have requested stuffed peppers. They choked down the last peppers I made – lol! Bless their hearts! Thanks for the recipe!! So nice of you to cook for them, Julie! If i were to prepare this outside of the crockpot could i brown the meat mixture before oven baking it in the peppers? Yes, definitely. You may want to boil the peppers for a couple of minutes ahead of time. I’m not sure if they would be too crunchy if you put them in the oven without doing that first. Can you prepare this and freeze uncooked? Added 1/2 cup of rice to the recipe…yum! Cindy, was that cooked rice? I like rice with mine as well, but not sure if I should add it to recipe raw or cooked. I always add rice to mine. I have used both white and brown, and yes add it raw to meat mixture. I’ve never put raw rice in my stuffed peppers, I always steam it first..so you can do it raw and it cooks? I’ve never tried. This recipe doesn’t call for rice. I usually serve rice on the side when I make it.